How’s the weather where you are? Is it cooling down yet? If so, I have just the thing. If not, let’s pretend it’s rainy and cold and you’re in desperate need of something soul-warming. I’ve made a butternut squash soup before that was inspired by Thom Kha Gai. I’ve also made a Sweet Potato Coconut Curry Soup, which is on the spicier side. But once fall hit, I couldn’t shake the idea of a curried butternut squash soup from my mind. It needed to happen. This recipe comes together in just 30 minutes and requires simple ingredients! Isn’t that the best kind of recipe? With fall in full swing now (at least in the Pacific Northwest), the butternut squash is abundant. I’ve started grabbing one or two every time I’m at the store. I’m becoming that lady. But how can I resist? Butternut squash knows no bounds. This soup is ideal for evenings when you want something simple and healthy. Make a batch ahead of time to have on hand for the coming week. It would also be great for entertaining and taking along to fall gatherings. Although it’s great on its own, I can’t help imagine how delicious this would be with a sandwich – especially my Chickpea Shawarma Sandwich and Chickpea Sunflower Sandwich! Serious yum. If you try this recipe, let us know what you think! Leave a comment, rate it, and don’t forget to take a picture and tag it #minimalistbaker on Instagram! We’d love to see what you come up with. Also, let us know if you have any holiday recipe requests! Thanksgiving is right around the corner (eep! ), and we’d love to know what you’re craving. Cheers, friends! Creamy Curried Butternut Squash Soup infused with coconut milk and yellow curry powder. A savory, simple soup that's perfect for the fall and winter months. Add coconut milk, vegetable broth, maple syrup or coconut sugar, and chili garlic paste (optional - for heat). *Inspired by my Simple Pumpkin Soup and Spicy Sweet Potato Curry Soup. Hi! I absolutely love your recipes and have made this one multiple times. So delicious! One comment I have though are your prep times. Your blog is fabulous but your prep times constantly set me up for disappointment. There’s no way I can prep in the amount of time you write and I misjudge how much time to give myself to make a meal. Just a small feedback, maybe it’s just me but there’s no way I can peel and dice 6 cups of butternut squash, shallots, garlic, and gather all my spices in 5 minutes. Again, FABULOUS recipe and blog though!! This was soooooo good! I didn’t have any curry powder so I used your recipe, and didn’t have any ginger so I used dried ginger snacks and … wait for it … (I hate it when others do that but am giddy about this!) … ginger beer! Mildly spicy with full-fat coconut milk … vegan and bladder healthy (see ic-network.com). The only feedback, and perhaps I’m just naive/inexperienced, was peeling and cubing the butternut squash took longer than 30 minutes. PS Greetings from NC! We are also former Pacific NW residents! So glad you liked it, Scott! Thanks for sharing your modifications! The recipe should mention to peel the squash so you do not get all the pesticides from the skin. The squash can be cooked first with the peel, once cooked, discard water, cool in cold water for a minute and remove the skin. 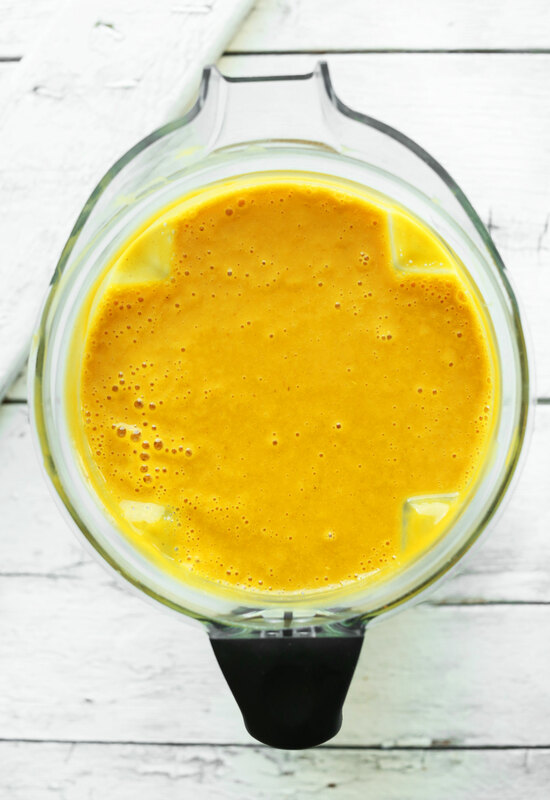 Put cooked squash and all other ingredients in blender. Thanks for catching this! The recipe has been updated. This was so simple and delicious. I’ve made it multiple times. Fabulous. Was looking for a soup recipe for some extra squash. Did not have the full amount of coconut milk on hand – but not important – it still was coconutty. I used a curry powder mix that has other spices in it. Fabulous. Soup was awesome. Adding it to my repertoire. Another score for MB. Glad you like it, Karla! Thanks for sharing! Perfect “snow day” recipe! I had an extra butternut squash from a farm box and roasted it, then needed a soup recipe. This was perfect…had some shallots and broth on hand but no coconut milk so subbed half soy creamer and coconut creamer (trader joe’s brand). I think roasting it first gave it more flavor and made it easier to blend. Put a little extra curry, added a dash of chili powder since I had no chili paste, and a dash of turmeric (because why not?). Followed everything else as written and wow…super yummy! 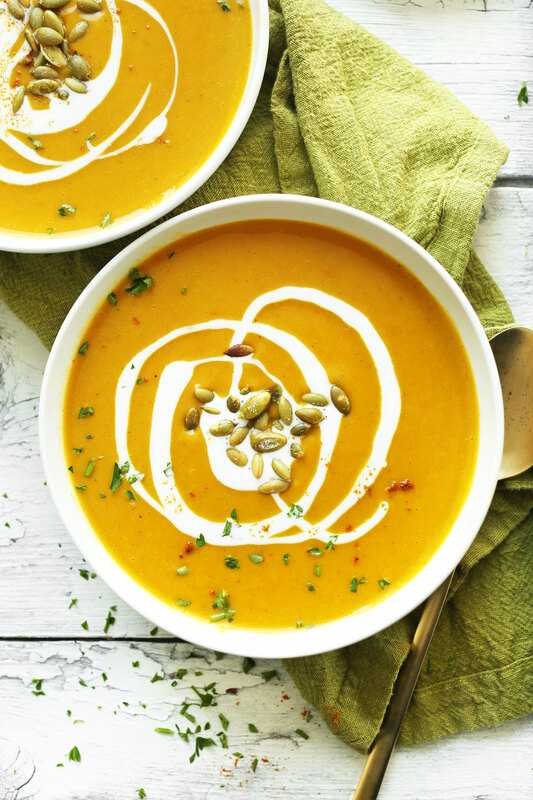 This is hands down my favorite recipe for a butternut suqash soup! A neighbor of mine brought it over as a gift shortly after I gave birth to my new baby girl. We ate it up and my 2 year old loved it too. It is now a staple recipe of mine. I have made it another 3 times over the past 3 months. Healthy! Warming! & Delicious! So delicious. I was out of coconut milk so used coconut cream. Made it so rich. I can taste the coconut sugar so would use 1/2 the amount next time (I am pretty much sugar free so it may not taste that sweet to others). I also used only 1 tablespoon of curry powder. A great soup! Thanks for sharing your process, Monika! We’re glad you enjoyed the recipe! I made this recipe this afternoon and it was delicious! I used the DIY curry powder and it had a lovely heat. I substituted the coconut oil with avocado oil, and added a little more curry powder and salt til it was perfect. It will now be my go to Butternut Squash Soup recipe, 2 thumbs up! This is an excellent recipe. I made it exactly as written, but without the optional chili garlic paste. My wife is sensitive to hot spices and I used Penzeys Sweet Curry Powder. It had a wonderful taste and was not hot. I am new to making curry’s so thought this was a safe approach, but next time I’ll make my own curry powder per your recipe and adjust the cayenne to taste. I am curious if mine turned out to thin. When I sprinkled the toasted pumpkin seeds on top they sank to the bottom. I used a light coconut milk as the recipe indicates. How did you get yours thick enough to float the seeds? Should I be looking for a light coconut milk with a certain amount of fat/thickness? Great on paper-probably unenforceable in practice, oh well.. Fantastic blend of ingredients, and it was HEAVENLY(!) but here are a few modification that may have helped. 1. Try to find a curry powder that has no chillies in it, then you can add that separately, to taste. 2. Dice the shallots, not slices. 3. BAKE the squash. Separate ends from neck. Put all face-down on rimmed baking sheet. Bake it until ends almost collapse and sugar-syrup is starting to run on the sheet. Remove from oven, put ends in a large bowl (I use a large Pyrex measuring cup and aim for 5-6 cups). Use solid metal spatula to scrape the syrup into bowl (lest it burn and be lost!). Return necks to oven and lower temp a bit or it may burn instead of caramelize the edges, and bake until extremely soft . Now scoop flesh out of the ends into bowl with the syrup. Vigorously stir in dry ingredients using whatever tool you like. When necks nearly mush, scoop out flesh and syrup, even if a bit caramelized, and mix vigorously. 4. Add coconut milk and broth (but NO sweeteners) to shallots/garlic and bring to a boil. Add the squash and reduce heat, simmer on low (use a lid!) until warm/hot, stirring occasionally. NOW add sweetening, IF NEEDED, to taste, warm further before serving. The result will have rich texture, no lumps, and not resemble a smooth gravy/puree/canned cream soup. I had roasted butternut squash on hand so used that. Didn’t have quite enough so I chopped up a sweet potato and threw that in to make enough. Completely forgot to add the maple syrup, but didn’t even need it. Tasted great without it and good to get rid of that extra sugar. Wanted to use ingredients already in my kitchen: sub an onion for shallot. Sub whole coconut milk for lite. Sub roasted red chili paste for garlic chili paste. Sub Hot Madras curry powder for curry powder. This soup had a nice amount of spicy heat. Gave some to a vegan friend. She likey. Seriously SO good! Loved it with the chili garlic sauce at the end. Forgot to say I used the instant pot and it worked like a charm! I make this soup all year long and LOVE IT! I add More curry because we are curry fans and enjoy the depth of flavor it adds to recipes. My husband adds the suggested chili paste to his to make it hot and Spicy. I’m making this right now with butternut squash which I am roasting first but normally make it with sweet meat squash. I quadrupled this recipe and brought it to a faculty meeting at the end of a rainy day. It was enjoyed by all. I added additional curry powder, about a tablespoon fresh (actually 4 TBS for the bigger batch) minced ginger, and more salt and pepper to taste. I also added BOTH maple syrup and date sugar. Finally, I did not add the chili paste, and served it with the toasted pumpkin seeds and the coconut cream as toppings. Everyone loved it…not just the vegans and GF colleagues. We all felt the warming qualities and it made me happy to make it for my colleagues on a cold, wet day. I have made this soup a few times now and everyone LOVES it!! One comment, though–the prep time is long. I’m wondering if I am doing something wrong. How do you cut the squash, shallots, and garlic in under 5 minutes? Or half an hour? This is a wonderful recipe! Easy to follow and Oh, so tasty. I actually used sweet potato once when I couldn’t find butternut squash. Very good. This soup is a regular at our house. I made this soup for Thanksgiving and it is the BEST butternut squash soup I’ve made or had. I used full fat coconut milk and a bit more curry ( I use Madras Curry Powder from Sun Brand-flavorful and available in the supermarket) and everyone raved and wanted the recipe. I made this soup for Thanksgiving and it has become a constant request from my non-vegan family. I am now required to bring it every Thanksgiving because they loved it so much. Thanks for the great recipe!! I just made this with one change. I turned on my oven to 500 and tossed the butternut squash with salt, pepper, curry and olive oil. While I prepped and sautéed the leeks and garlic, the butternut squash roasted (approximately 8-10 minutes it was still al dente) and it imparted a roasted sweet flavor. It came out great and was a big hit! i made this as directed. we used the garlic chili paste. the flavor is just right. 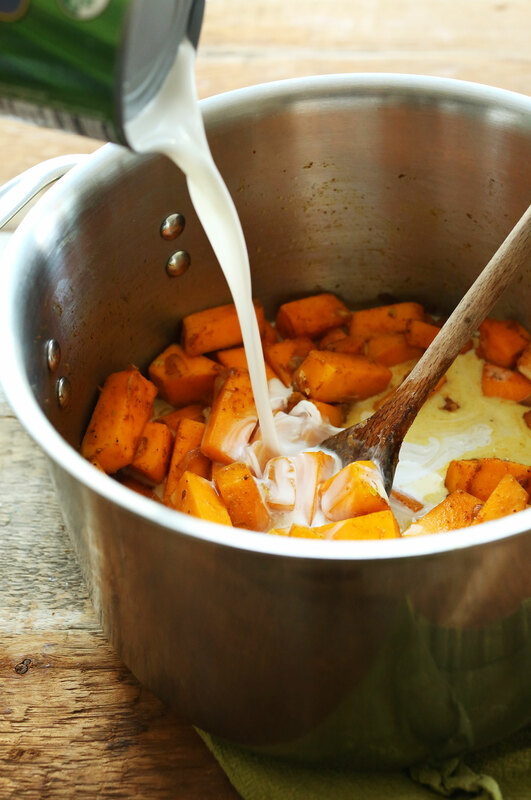 we found that it was missing fat…that creamy thickness that i’ve tasted in other butternut squash soups. here it starts off creamy in the front but ends thin in the back of the mouth, if anyone can understand that. we thought about butter. i dont know if more coconut milk will do it and i don’t want it to affect the flavor too much…l’m at a loss. This soup was a huge hit!!! Perfect in every way. The curry did not make it spicey hot at all as some comments said, and since I didn’t have the chili garlic paste, i added hot chili powder as a topping which only made the soup better. My lunch guests could not stop complimenting me on it. Even my husband loved i. Whoop! We are glad it was a hit, Raiza! Great recipe. Easy fast tasty. I didn’t find it too spicy from regular curry powder although you may want to avoid using curry powders that are labeled ‘hot’. Heat comes from the addition of the chili paste. I didn’t have any so I used Siracha. Also used honey instead of maple syrup. Will make again. This is such a wonderful soup! I have made it three or four times now and each time it turns out great. Even my six year old daughter loves it and she is not a fan of spicy food and she has never had curry before! It is a keeper. Perfect amount of flavour and little spice, just enough to make my taste buds dance! I added 1 more tbsp of curry powder, 2 more cloves of garlic, and modified the chili paste to 1 tbsp. The recipe doesn’t NEED these modifications, but it will make it a lot more flavorful. This soup is awesome. I would like to substitute fat free half and half for the coconut milk (husband likes curry, but not coconut). Will that work? Wow, this soup was delicious. A couple of tips…we like heat, but I was surprised how a small amount of the Chili garlic paste brought the heat! So, be careful when adding. Also, I chose not to puree the soup. I left it the cut up pieces of squash, I did mash a little bit to make the broth a little thicker, but I loved it this way. If you’re a texture person like me, it took away the thought of eating baby food. Honestly, this soup is so amazing though, I would have eaten it anyway! Thanks for the recipe! I made this and roasted the squash instead of cooking it with the other ingredients and it was soooo good! Very delicious I plan on making it again! This was AMAZING. I love the combination of sweet and savory, and it came together so quickly. Another great minimalist baker recipe! i had a ton of butternut squash from the garden, and i have made lots of different things, from risotto to roasted, and, of course, soup. i was looking for something a little different than the typical soup, and came across this recipe. i roasted the squash first, as i have found it gives it a bit more depth of flavor, and i omitted the maple syrup, as i am not a fan of too sweet. in any case, this is delicious. 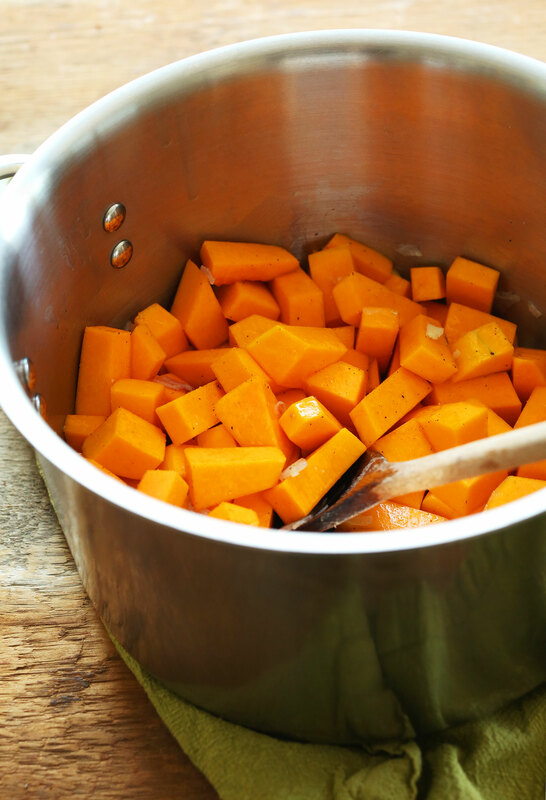 absolutely my favorite butternut squash soup recipe ever. thank you! Just made this and love it! I didn’t have canned coconut milk so I used coconut milk from the carton. It ended up more liquidy than I think it’s supposed to be so next time I’ll just use less. Doubled the recipe so I’ll havw it for a while! This soup is amazing! So many flavors, nothing like any other soup. Will definitely make again. A co worker made this and shared a spoonful with me. I have not eaten butternut squash before. This was so tasty, I am going out on a rainy and cold day to purchase the ingredients to make. She used fresh I will try frozen. I expect to have a bowl with some buttery toasty bread. Can’t wait Thanks for Sharing and keep up the good work. Omg same thing my coworker let me taste a spoonful. The next two days was very cold and rainy so you guessed it I made as well. Just wished I doubled the Ingredients. Not sure about sharing lol too good. Love this soup, I used epicure mango curry and added an apple, will definitely make again! Great! Thanks for sharing, Wanda! Easy soup to make. Fantastic taste. I’m not a fan of squash either. I did roast the butternut first. Nothing but a little oil on it. So flavorful. I highly recommend this recipe. By far, one of the best soups I’ve ever made. I’m so excited to share this with friends & family. I thought the spices were perfect & added a great balance to the sweet – a wonderful combination of flavors! I love this recipe. 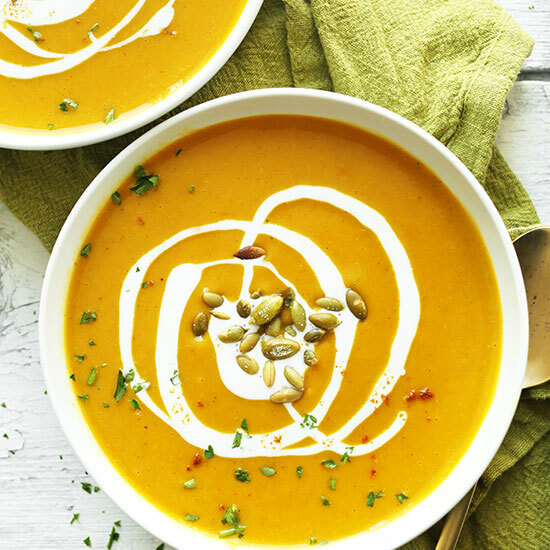 So many butternut squash soups are just sweet and have little flavor, but this one’s got some serious flavor. I made it to the letter, and it didn’t disappoint! Just made this last night. It was pretty good, but if I’m being completely honest, it was not my favorite butternut squash recipe. I did not find it overly spicy, as a previous comment mentioned. In fact, I found it too sweet. The chili sauce actually helped a lot, and just a smidge more salt. Were I to make it again, I’d cut down on the maple syrup, using maybe only a single tablespoon rather than the 2-3 called for. I will also add that my 1-year-old son LOVED it. He hates being fed from a spoon, but was ate this soup off the spoon no problem! Best butternut squash soup I’ve ever made! So easy! Couldn’t wait to bring a squash home from the farmers market! Thanks again, Dana! I have looked through all of the questions and don’t see this one, so forgive me if it is a repeat. Can you substitute chicken broth for the vegetable broth? Thank you so much, looking forward to trying this! Made this tonight to use up leftover butternut squash. My usual recipe has cream but hubby is now dairy-free so this version with coconut milk (unsweetened, full fat is what I had in the cupboard) was amazingly delicious! Just the right balance of sweet and spicy, and quick to the table top. Paired with a green salad and topped with slivered almonds. I’ll definitely make it again. This recipe is a keeper! I love it <3 I added a TBL of natural molasses it's divine. This looks fab!! I know it would be better with fresh, but for now I have some TJ’s canned butternut squash purée…how many cans do you think I would need? This is the first butternut squash soup that I’ve eaten and loved…sooo comforting, warming and just spicy enough. I personally do not like sweet (or apple) in squash soup so I leave the maple out and think it’s perfect. Yummmmm. I truly believe I could eat this everyday for the rest of my life and never grow tired of it. I made this and loved it! I added cayenne for a spicy kick and used chicken broth. I think next time I will skip the cinnamon and substitute the maple syrup with honey. Yay! Thanks for sharing, Lulu! I love this recipe. Very easy and its so delicious! My parents think so too :). Just one question-how much is one serving? Hi Tricia! Each serving is about 1.5 cups. We are glad that you and your parents are loving it! Loved this, and I usually don’t like soup! I used it with a little less curry powder and a little more maple syrup. The pumpkin seeds go really well with it! I roasted the squash -cut in half, drizzled with olive oil and maple syrup, added nutmeg, cut the curry to 1 1/2 tsp, used penzey spices, mild curry powder. At the end I added two ears of fresh corn. Wonderful! Made this tonight with local grown squash. Was by far the easiest and cheapest recipe I found !! The swapped oils for butter in the beginning cause I didn’t have them. Turned out delicious !! The only thing was I think I’d add chilies next time or jalapeños. Otherwise awesome ! This is definitely a good base recipe, but it definitely lacks in flavor. I strongly recommend adding MUCH many spices. I added a generous amount of nutmeg, cumin, chili powder, and other spices and only then was it really nicely seasoned. If more mild flavors are you thing, this recipe is great, but personally I like things with a bit more spice. That being said, with a few personal tweaks, this is a great recipe that I’ll definitely use again! This recipe was soooo good! I only used a small can of coconut milk and just added a little more broth. The flavour was still really powerful and super delicious. This is my new favourite soup recipe! This is one of my family’s favorite soups. I follow the recipe as written with a few modifications. First, I cut the squash lengthwise, remove seeds, and roast skin-side up until skin is soft to the touch. I let cool then scoop out flesh. Second modification is that I use only one Tbsp of maple syrup – otherwise (for us) it’s way too sweet. The addition of pumpkin seeds adds some great texture. I serve with Tyler Florence’s chorizo empanadas with cilantro crema. My modifications here are: I use soyrizo vs. chorizo; no olives (hubby doesn’t like); add a chopped roasted red pepper; use pie crust instead of making my own. Crema is simply Fage yogurt, lime, a bit of cumin and chopped cilantro. Somehow it all works! Yum! Thanks for sharing your recipe changes with us, Kathy! We are glad to hear you enjoyed it! Incredible take on the traditional recipe, I added Cape Malay curry dry mix…and sweet potato … delicious …thank you! I was sick for a couple days with a cold, better yesterday, back to sick today. I made this soup, and I’m feeling fantastic at the moment! Definitely recommended for coming back from a cold. I added ginger and more garlic, and subbed onions for the shallots. I did probably 1/2 the curry powder so as not to be too spicy. I also found out mid through that I didn’t have any coconut milk that I thought I had. So I made homemade coconut milk instead: blend 1 cup shredded coconut with 2 cups hot water (I used a Vitamix, not sure if a regular blender would do it). Then squeeze through a nut milk bag. I think this is roughly equivalent to full-fat canned coconut milk. I meant to add that I also skipped the sweetener. I don’t miss it. I bet it would be good with an apple in it though. I made this for my daughter who is a vegetarian but eats very little dairy. She is still napping but my youngest daughter and husband, who swears he hates anything with coconut milk, both loved it. I was a bit worried when I tasted it at the start of the simmer, but then realized I’d forgotten to add the maple syrup. The syrup really rounds out the flavor. I used an immersion blender and this soup came out very creamy and looks so pretty in the bowl. I love so many of your recipes. Thank you especially for this one. This is one of my very favorite recipes! I highly recommend pairing it with the chickpea shawarma sandwich – so, so delicious! This soup is so good. I’ve made several of your recipes now and I’m never disappointed. Thank you for making healthy food that is also delicious. Such a delicious recipe! The chili paste adds a nice warmth and heat to the soup! Possibly the BEST soup ever. Have made it twice and has turned out amazing both times. Didn’t measure any of the ingredients – guessed everything and it turned out fantastic. TIP: I was too lazy to try and get the rinds off the squash so I cut it into pieces and roasted it first. Skins popped right off and added extra flavour to the soup. Just amazing! Made this yesterday. All measurements the same. I used V8 juice for the vegetable broth and a 4 oz can tomato sauce. It was lovely. My hubby wanted to add chick peas for some crunch. I may add canalini or northern. We’ll have to see…. Hi! Am midway through making this. It would have been helpful to know whether the squash should be chopped into large/small chunks or left whole – totally not clear! Also – garlic chilli paste? Recipe? Thank you. Hi Lisa, Thank you for the feedback! We’ll make the instructions clearer here. Hope you enjoyed the soup! I’ve made this several times now and it never fails! Always so delicious and super easy! Great recipe-brought it to a potluck and everyone loved it. I love it! I think I’m going to start eating it for breakfast! I think the yellow curry is what made it special…haven’t made butternut squash soup with yellow curry before. Thanks! I’ve made this soup multiple times and I’m absolutely in love with it! I love the spice kick and flavor blends, its a twist on traditional butternut squash soups. I’ve always loved butternut squash soup, in all its shapes and sizes, but this is my favorite. This soup was soooooo perfect! I mean, I just wanted to drink it. And the fragrance while it is cooking???? unfreakingbelievable how good the curry and cinnamon smell. I need to make batches of this to freeze while the squash are still good! Everybody loves it, major hit! As far as the curry comments….1.5 tbsp worked great for me. I guess it depends on where you get your curry from! Excellent recipe; my ‘on the fly’ adjustment was to mix in the top heavy cream from the coconut milk can during the saute phase and then deglaze the pot with a few splashes of apple cider. After letting that mixture cook (covered) for several minutes, I followed rest of the recipe and was delighted with the result. The cider and coconut blend was aromatic and really brought out the curry/squash flavors (I used a mix of regular curry powder and some hot ginger curry powder). Will make again to test these unplanned variations! Made this tonight with the only change being full fat coconut milk rather than light! Creamy, a bit of heat, and perfect for a sub zero night! Served it with the loaded kale salad. Hello. Should I use sweetened or unsweetened coconut milk? This was an amazing taste sensation. I used left over roasted butternut squash which was naturally sweet, so deleted the maple syrup. Will definitely make again for family and company. Perfect soup that I made several times already! It’s so creamy and comforting, and very warming too thanks to the spices. Yet another delicious and easy recipe from Minimalist Baker! Thank you so much for making my life simpler. I love this soup! I’ve made it twice now – once for my husband and a friend, and once for my office Thanksgiving potluck. It has been a hit each time! It’s very flavorful, rich, creamy and delicious. The only thing that makes it spicy is the chili garlic paste – go easy on that, depending on how spicy you and your guests like your food. Can’t wait to make it again! Really tasty. Other butternut squash recipes tasted to me like pumpkin pie. This was a new spin on it for me. I liked it a lot. I made this last night and it was delicious! Next time, I will double the recipe. I didn’t have shallots, so I used some chopped onions. I didn’t have lite coconut milk, so I used regular. I did not change the spices at all. I did roast the butternut squash first. It was great and I’m looking forward to trying out more of your recipes. I made this recipe this afternoon, exactly the way it was written, and it was absolutely perfect – easy, quick, and tasty as all get-out. Thank you for the permanent addition to my repertoire! Loved this soup; flavors just jump out at you but very balanced! I tweaked it a bit but still followed the recipe pretty closely. I used leftover squash and yams from Thanksgiving and added the spices to the onions and garlic (didn’t have shallots) and coconut so the their flavors would bloom first. The person who commented 1 1/2 tablespoonfuls of curry powder was too spicy used the wrong kind!! I used the sweet yellow curry powder from Penzeys and it was perfect! Added the juice of 1 small fresh lime as well that gave it a nice hit of acid and helped balance it out. Also added freshly ground pepper and seasoned salt, to taste and 1 tablespoon butter to finish with. Garnished with creme fraiche, fresh minced cilantro, and a drizzle melted butter mixed with a little curry powder and smoked paprika. My husband absolutely loved it!! Great cool weather Soup!! I’m really picky about butternut squash soup, because the last time anyone in my family made it, it ended up bland and not very good at all. This soup, however, is AMAZING. I did two things differently than specified in the recipe: first, I roasted the squash at 400 degrees Fahrenheit for around 30 minutes (basically the instructions from the Butternut Pecan Sweet Potato Mash) so it was already fork-tender before I added it to the soup pan. Second, I didn’t blend the soup, because my blender is garbage and I didn’t want to get the food processor out and I don’t have an immersion blender. Because the squash was already tender, it resulted in a chunky potato-soup consistency with the good good flavor of this curried butternut squash. OH! I also didn’t have garlic chili PASTE, but I used garlic chili SAUCE that I found in the Asian food section of the grocery store, and it worked just fine. I just made this for the first time and oh my gosh it is wonderful! I followed the directions to the letter. I had the full-fat coconut milk but not the chili paste or pumpkin seeds. A drizzle of that on top was perfect. It was so rich and flavorful. I am new to veganism – i’ve tried lots of recipes over the last couple months. This is the best by far! Thank you for sharing your expertise! I’m hooked. I just noticed you have a cookbook. I’ll be ordering that. My sister and I made this for Thanksgiving and it was spectacular. We weren’t precise with the measurements; a full, large butternut went in and we and left out the garlic and sugar, instead adding in cumin and two roasted poblano peppers with the seeds, which added a nice kick. Thanks for the awesome recipe! Glad you loved it, Maxine! Just made this for TG, it was fantastic! My first time making soup from scratch. It came out great! It took me longer than 5 minutes to prep, but that’s because I have never cut a butternut squash before. I will definitely make it again! Hello! Just made this tonight after I adapted it to the pressure cooker and it turned out delicious. Thanks for the recipe! Awesome soup! Thank you for sharing the recipe. My whole family raved about it! I like most of the recipes on here. But I don’t understand why this soup needed maple syrup and cinnamon. But it’s a taste preference. I would omit the sweetness of both those items and also the coconut. I like flavors but not sweet mixed with curry powder. Indian flavors are best when paired properly. I used ghee for oil and curry powder with chili powder. I also added curry leaves. Need to sauté the curry powder a bit. And I added lemon. Well that’s my bit on this recipe. The squash has a naturally sweet flavor to it. Oh and I roasted it before I added it to the garlic and shallots. Happy cooking. I just finished making this soup and it is so good!!! I have made butternut squash soups before, but not using curry and I have to say that the curry gives the soup such a great earthy flavor. However, I used half the amount of curry called for in the recipe. I would suggest to start off with half and add more later after tasting. 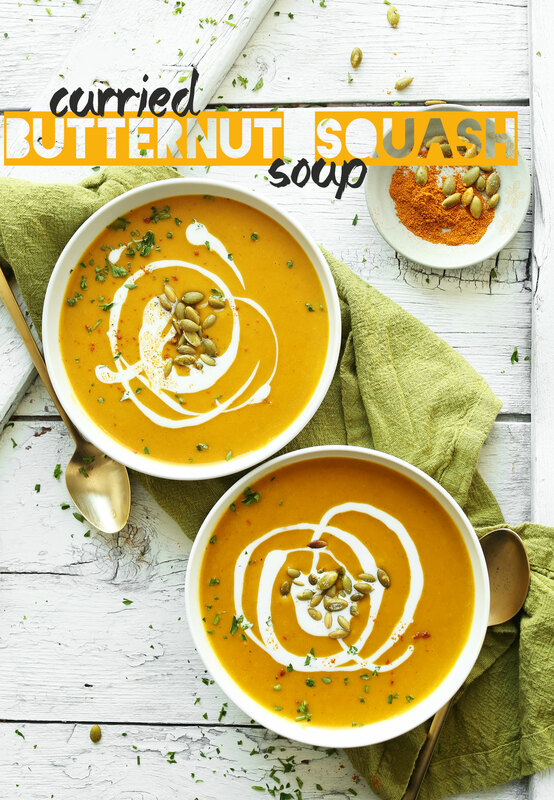 This is definitely now my go-to butternut squash soup recipe!! YUM! I added 1/8 tsp red pepper flakes. Yum! Hi, I was seriously doubting butternut squash soup without real cream but this was SO delicious, thank you minimalist baker! I subbed onion and garlic for shallot and it was still super yummy. My most successful soup since I started making them a month ago. Wow so easy and good! Thank you for putting this recipe on line. Hi Lynda! Yes! You can either freeze leftovers or refrigerate and eat the leftovers throughout the week! I even find that leftover soup tastes better after it has been in the fridge for a couple of days. I made this, it is so good. But I don’t know what the actual serving size is. And how to figure calories. I ended up with a lot. No way I could. Eat a 1/4 recipe at one time. I was in a hurry so I didn’t use the vitamix, went with the immersion blender instead and it came out so smooth, yes! Adding this one to the fall lineup for sure! Family loved the soup. We added onions because we like them and we did not have shallots. We don’t care if stuff is smooth and like chunky. 2 butternut squash was about 1.5 recipes worth. Thanks for a great idea. How do you peel a squash?? I’m assuming that you peeled it anyway. I’ve only ever roasted squash and it looks like it’s uncooked and you have it cut into chunks. I poked holes in the squash with a fork, cut off both ends, and microwaved for 5 minutes. Let it cool some, then peel with a potato peeler. I used full fat coconut milk, 2 full sized carrots in place of the sugar/molasses, extra cinnamon and no curry. Loved it! Thanks for posting. I used one tablespoon curry powder and added an apple, peeled and cut into chunks. Soup was delicious? This soup looks and sounds great. I have an amazing carrot crop this year…could I substitute roasted carrots for the squash?? Hi Jeff! I think you could, but I would add a potato or 2 to achieve similar texture! yum this soup was amazeballs !!!! I used the full amount of (balinese curry ) and hot sauce and fresh parsley my daughter who absolutely does not like curry loved it !!! oh and also used half acorn and half butternut squash yum yum yum !!!! Can you add a note with the toppings on how to present them as they are in the picture? Do you mix the chili paste with the full fat coconut milk and put that in a squirt container to swirl on the soup? Please tell! Great soup! Made tonight, used 2T curry. We weren’t expecting it to be as good as it was, carnivore approved. I made this and loved it. I will be making it again for thanksgiving’s dinner! Delish! Perfect fall soup. I cheated ant used purred organic butternut squash out of a can. Amazingly simple and bounding with flavor. I used extra curry and added a dab of jarred harissa. This recipe is a keeper, love the coconut milk with the spices. Thank you! This is the best soup EVER!!! Omg it might even be my favourite meal ever! Once a month, I have a mass cooking day – where I make stuff to freeze to bring for lunch or dinner. Today was that day, and although it was 80 degrees and muggy as all get out, I decided the squash on my counter had to go and this recipe was where it was heading! I don’t have the patience for peeling and chopping, so I stuck it a couple of times with a knife and threw it in the oven for an hour, along with an acorn squash. Good thing cause I didn’t have enough squash from the one for the recipe! I wound up using both squashes and a sweet potato! Used full fat coconut milk, cause that’s what I had, the full amount of Curry and a splash of maple syrup. WOW WOW WOW!!!! I’m having this for dinner tonight – love the chopped apple idea so going with that as a topper. Thanks so much for this – it’s going in the “keeper” file! Hi Karen! You could leave it out! Ok! On that note, I will probably use our fresh raw goat milk in it’s place… just for a little creaminess. Thanks! Fantastic recipe!! I added one cup red lentils for protein and used full fat coconut milk. out of shallots so used a small yellow onion. Could not be more tasty!! What is the green herb in your pictures? Is it cilantro or parsley? I made this for the first time tonight and it was delicious! Based on the comments I started with one tablespoon of curry powder as I’m a wimp with spicy foods and that was perfect. I recommend folks start there and always add more as needed. I bought pre-chopped butternut squash from Trader Joes so this meal was on the table 20 minutes after I started! Perfect for a weeknight and some cooler temps. In response to others’ comments: I’m relatively new to the curry world, so I just used basic McCormick curry powder found in the spice section ( I had no idea there were other types of curry powder). Similarly to the experiences of others, it worked well, was not too spicy, and I actually added an extra teaspoon or so. I also roasted my squash, just because roasted veggies are my favorite. Taking a page from Dana’s Coconut Red Curry with Chickpeas, my favorite curry recipe, I added frozen peas at the end and it was bomb. I also toasted up some vegan naan and dipped that in the soup, because, seriously, why the hell not?! Thank you, Dana, for another great recipe! I have used this recipe several times and it has become a fall staple in my house. I always add the chili sauce for some heat, as well as grated ginger. I have also substituted onion for the shallots. This recipe is simple to make and extremely flavorful. It’s one I will come back to time and time again. Our family loves this soup! Our non vegetarian friends/family also love it. We use a tbl of curry for us. The only thing extra that we add is about an inch of fresh grated ginger. It adds a nice warmth. Just made this soup, I did not add 1 1/2 tbsp of curry, only added maybe 1/2 tsp and additional 2 Tbsp. Maple Syrup and I am very pleased! It is delicious and glad I only used a little curry. Although I’m not a professional cook, but I do know if there is an ingrediant I not sure about especially a seasoning I aid on the side of caution. Always remember with a soup you can always add a little more, but you cannot remove it once you’ve added it. OMG! This is my favorite thing in the entire world. I could eat this every single day, it is that good! Everyone NEEDS to try this at least once! Absolutely amazing! I made this soup today. It was easy and delicious! The only substitution I made was regular coconut milk for the light because I didn’t have the light on hand. I stumbled across this recipe last year and have made it several times since, including tonight. It is amazing! One of my all time favorite soup recipes! And always a crowd pleaser. : ) Thank you for sharing it! This will be the 5th of your recipes I have tried – none of them have failed me yet!!! I’m so excited. Right now I actually have your “Vegan Banana Nut muffins for 2” in my oven baking and am about to make this soup for dinner .. so thats a double whammy MB day!! Yum!! Thanks for all your great recipes and for inadvertently helping me transition to a plant based lifestyle. Absolutely delicious!!! Made this to take to lunch at my mums house and the family all loved it and had two bowls each. I roasted the butternut in the oven first with olive oil drizzled over. Then added the cooked butternut to the pot after with the garlic, onion, curry powder, cinnamon etc. I’ll definitely use this recipe again, soooo tasty and simple to make. I made this tonight and it was delicious!!! Made exactly as written, only used pre cooked leftover squash. I loved it and my three kids really enjoyed it too! A keeper for sure!!! I made this soup for my wife and I. We love spicy and the recipe resulted in a, by our assessment, delicate yet flavorful bowl of comfort. I would go as far as tossing a little toasted coconut on top with the pumpkin to accentuate the Indian flavors! This was amazing !! :) I added sweet potato and carrots and my boyfriend said it was to die for . Leftovers were great as well! I love this soup. I was looking for something a little different than the standard butternut squash soup and this was it. I adore the coconut and curry combo, it is delish. I’ve made it twice, once for my family and everyone loved it and again for a New Years eve party and it got a lot of compliments. So thanks for simple but really tasty recipe. Just made this and it will definitely be a go-to recipe for me! Thank you! I made this for the second time last night! This is now my go-to butternut squash soup recipe. I love the spiciness from the garlic chili paste and the richness from the coconut milk (I used full fat coconut milk for extra creaminess). Thank you for your recipes that never disappoint, Dana! This was amazing! I doubled the recipe to make for a church event, and it was a hit! I omitted the sugar altogether and used full fat coconut milk (because it’s what I had) and it was still delicious. I’m pretty wimpy when it comes to spice, and the curry wasn’t too spicy at all. I even added a little chili garlic paste, and it made it divine. Thanks so much for this recipe! This soup is AMAZING. I made it exactly as the recipe says, wouldn’t change a thing. I made up some rice to have along with it (trying to make it a more filling meal. For leftovers we also added steamed vegetables). We topped the soup with toasted pumpkin seeds, toasted coconut, and fresh cilantro. This soup is JUST what we’ve been looking for!! Made it for the first time (assuming there will be many more) tonight and we loved it. I made it with only one cup of broth, which made it a bit thicker, although I did also have only a scant six cups of squash. Seasoning was perfect! I used a Sweet Curry and Saigon Cinnamon. We will certainly return to this soup!! Delicious! Thank you! Making this for the third time tomorrow. It’s incredible! I use it as a gateway drug to introduce sceptics to plant-based recipes. I’ve made this twice now and it is delicious. I added way more curry (personal preference) and it was a hit in three households!! I also added 16 oz of tofu before turning it on purée. Just wonderful. I love this soup! It’s so easy to make and it impresses guests. Thanks for a wonderful jumping off point. I used your recipe as inspiration for a similar soup but made several changes. Roasted the butternut squash with garlic. Added fresh ginger to the sauteed veggies. Added sweet potato. Left out the sweetener. Blended it all together and garnished with cilantro and toasted sunflower seeds. SOOOO delicious! Thanks! Best soup I’ve made lately! Thanks a lot for sharing this delicious recipe! Can the soup be made in a larger batch then frozen? Great idea! You bet! Store in the freezer for up to a month! This was such an easy recipe and is absolutely delicious. I added a little red pepper and extra curry powder for some heat; but otherwise followed the recipe to a tee! Mmm Mmm Love this recipe! I loved this soup! In fact I love all your soup recipes. So good for the belly and heart. I made this soup tonight for my guests and it was a big success. Easy to prepare. Not time consuming either. Perfect recipe! I used homemade fresh coconut milk. Any idea on how to alter the recipe to be made in a slow cooker? My instinct is low for 5ish hours and then add the coconut milk? Hi! I think that should work nicely! Thought I haven’t tested it myself, let me know how it turns out! Made this (more or less) for our Gourmet Club soup & salad dinner, 6 1/2 couples, &, most everyone had some with many compliments. Used ~ 8 cups of diced, homegrown squash, didn’t have grape or coconut oil, so used olive, really big shallots, 4 – 5 cloves garlic, & added ~ 2 cups chopped leak leaves & 2 small tomatos, chopped. Used ~ 3 T (old) curry powder, ~ 2 T cinnamon sugar, ~ 20 oz sweetened almond milk (leftover from kids visiting at Xmas), vegetable bullion instead of broth, ~ 5 T chili sauce, & ~ 1 t garlic powder. Came out brown sugar brown. Served w/ coconut milk garnish. Used real VT maple syrup, and you can taste it, even over the spices. Yummy! &, w/ the coconut milk, not too spicy. Love it! First time and now forever lover. Granted it’s a one and a like 6 months recipe considering carb count. However, something I will look forward to twice a year. My husband and daughter loved it. Went heavy on the coconut milk and made a garlic, curry, paprika sour cream garnish. I’ve made this soup twice, exactly as the recipe calls for it. I’ve also made Dana’s Curried Sweet Potato Soup, and comparing the two (they’re somewhat similar recipes/processes), I have to say I love the butternut squash the best. It’s creamy, hearty, and the perfect soup to share with friends on a cold day. This will definitely be a favorite I’ll return to each year. So delicious, I used Garam Masala instead of “curry powder”. It’s delicious! Thank you for sharing this recipe! Made this for a Vegan friend who just had surgery, thankfully I doubled it so that I could keep some! It is so creamy and smooth, love it! Loved this recipe! 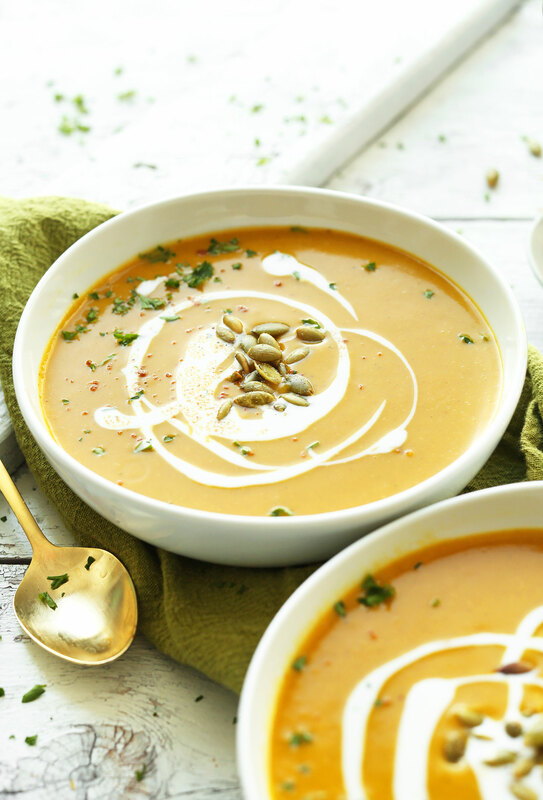 I’ve made so many variations to squash or pumpkin soup and this is my favorite. I made slight changes based on my diet and ingredients I had on hand which I’d like to recommend. *I used a can of trader joe’s reduced fat coconut milk, slightly creamier than light coconut milk and less creamy than full fat. Mainly bc this is what I had on hand. *Instead of maple syrup I used 1 small honey crisp apple (peeled and chopped up), added with squash. I’m on weightwatchers and apple’s are “free”, syrup is not. This gave it that little bit of sweetness to balance spice. *I used amount of curry powder recipe called for, my jar of curry powder is not very potent/spicy. Other reviewers are right, it depends on both your curry on hand and your taste preference. Mine came out perfect, just a little heat. I added 1.5 tsp of Curry and only added 1 TBS of maple syrup. I would say it is sweet enough without it. When I make it again I will omit the syrup. Nice soup! Thank you for this recipe. This soup is delicious! I used regular coconut milk and chicken stock since that’s what I had on hand. Substituted raisins for the maple syrup to be Whole30 program compliant. Added a pinch of cayenne for a nice kick. Topped with natural cococut chips, but it is fabulous with no garnish. This will be a fall and winter staple for us! Hi! Adding my voice to the chorus of fans of this amazing and versatile soup recipe! I originally found this when we were mostly plant-based in 2015 and it became a family fave. Thankfully we’ve been able to adapt it for the Whole30 we’re doing this month by omitting the maple syrup, subbing in an apple for sweetness, and using a compliant broth. Topped it with chopped compliant bacon, lime juice and cilantro. Still amazing! Thanks for all of your work in creating yummy and accessible recipes for all types of eaters! I absolutely love this recipe and everyone that tries it asks for it also! So yummy! Just made this, wonderful and very simple to make. I substituted the spicy curry for sweet curry. I wouldn’t add the maple syrup next time. I like this soup better savory and not sweet. Otherwise a good recipe. I also prefer to roast the squash first because the flavor is better. I LOVE ME SOME PUMPKIN! I made this for New Years’ Eve and the whole family LOVED it. The soup has alot of flavor and is very rich. Thanks again! I made this today and was surprised by the luke warm reviews from family. I have a fairly mild curry powder, so I used the recommended amount and was told that’s all they could taste. Not the coconut or anything else. I liked it, but it’s a lot of soup for just 1 fan. Made this today. Only had full fat coconut milk and curry paste buy it came out so creamy and delicious. I might add more heat next time. I served it with warm garlic naan. Oh yeah!!? Can’t wait to make for guests! I just made this soup to start off the new year right. It’s love in a bowl! I couldn’t find the garlic chili paste so I didn’t add. Instead I increased the medium curry I used to 2 T. and added 1/8 t. more of cinnamon. The only maple syrup I had on hand was a brandy maple syrup, used 2 T. Just the right amount of sweetness. This soup is good for your body and soul, thank you! I made this tonight for my extended family’s New Year’s Eve dinner. I didn’t have any shallots on hand so used onions, and the squash I used was a nondescript orange-fleshed squash, not butternut. I’m very happy with how it turned out! Easy to prepare, great flavor, and nice to be able to provide a yummy vegan dish for vegan family members. Thank you! Delicious! I roasted the squash halves in the oven (400 degrees for approx 40 min) instead of cubing & cooking on the stove top 1) because scooping out roasted, cooked squash from the shell is easier than peeling & cubing it raw, and 2) I love the added flavor of the slightly caramelized roasted squash. I added chopped dried Salaam India chili peppers for heat. Not only does this taste wonderful, your house smells amazing while it’s cooking. So glad I made a double batch! I look forward to trying this recipe over the New Year weekend. Will definitely post after trying. Question for you, what green did you use to garnish for the photo? Is it cilantro, parsley, thyme? It really makes the photo pop! Beautiful artistic photography and looks like a lush soup! Happy New Year. Hi! Yes it is a must try for sure! That is smoked paprika and parsley but you can use cilantro as well! Happy cooking! Hello! Thank you for sharing your time and recipes. I just made this and my mother and I LOVED it! Just enough of all flavors. I used whole fat coconut milk and coconut sugar! Worked out great! Next time I’ll make chili garlic paste and roast pumpkin seeds. Great easy recipe! Thanks again! Oh. My. This soup was deliciously sweet and savory. I added an apple and topped the soup with the seeds from the squash that I boiled for 10 minutes and then salted and roasted and also with some fresh sage leaves that I fried up. With the apple in the mix I only added a dash of maple syrup and it was plenty sweet. Seasoned with the curry powder to taste because I was hesitant to put the full amount and glad that I held off. Yummy yummy — this one’s going in the recipe box! Also, used full fat coconut milk instead of lite. Made this tonight, my squash didn’t make nearly as many cups as I thought it would so I added a bunch of carrots and a red bell pepper. My husband added liquid smoke to it – which was a brilliant addition. Love the versatility of this recipient! It was really delicious! Just made this tonight. It is delicious, warming and earthy with the curry. Heat was just right, but I may leave out some of the maple syrup next time. This is comfort food. This soup is delicious! I didn’t have coconut milk so I had to leave it out, but it was still amazing, and I’m sure would be even better with the coconut milk. i forgot to give it a 5! I loved this soup. I didn’t have broth so I used water and added more curry a, cayenne,nd garlic. I served this with sour cream and toasted seeds with cayenne, onion powder, garlic powder, salt and pepper. Thank-you for your recipe. This is delicious! I made this on a foggy, cold, rainy night and it was just perfect. Some of the reviews commented that it was too spicy – I used “Indian curry without salt” and 1.5 tbsp was a great amount. The only reason it got a little spicy was that I was a bit heavy-handed with the sriracha (totally my over-enthusiasm and even then, still very delicious!). This is a great recipe – and so easy!! It’s a perfect recipe! I roasted the squash first. Delicious!! This soup is wonderful. I had been looking for a go to butternut squash soup recipe and this is it. I make my own curry powder using – I omit the hot chilies so that it’s flavorful but not spicy) and I also roast the butternut squash first. I’m going to make an extra large batch when I host our office holiday party later this week. Thanks, Dana! You always have amazing recipes. Perfect soup, loved by hubby and 3 kids (including 16 month old baby — he drank it by the bowl). I used less curry and no sweetener, but regular coconut milk, just delicious, mildly spicy and satisfyingly sweet. I just made it, maybe it was my curry powder, but it was pretty bland to me. I went over the recipe a few times to see if I left anything out… I didn’t add the sweeting, perhaps that was it? I must change my review! I doubled the curry and added the juice of a small lemon to brighten it up. (I never used the sweetening) I simmered it a while and then let it sit for a few hours. It was much better. I’m sure I’ll make it again. Yeah, depending on the sweetness of your squash that can definitely help! And of course, more curry powder + salt will always help, too. Not too spicy for our immediate family. Even added a bit more curry. So soothing. This soup is the best. Will be making it again soon. I’m a pretty good cook, and I’ve done a lot of cooking in my life. I’m not exaggerating when I say this is the most delicious soup I have ever made! Only change I made was using a small onion instead of the shallots, and chicken broth instead of vegetable broth. Also used only 2 tablespoons of maple sera. It was unbelievably delicious. Made this last night for a large family gathering, doubled the recipe, and it was a huge hit. Even those who profess to not like curry cleaned their bowls. Than you for a nutritious, delicious, filling recipe that pleased a crowd! Enjoying the leftovers now and even tastier day 2. I made this tonight and it was a wonderful soup. I followed the recipe exactly (by weight) and didn’t have the issues with too much curry as some had noted, but I used “regular” and not the spicy curry…maybe that made the difference. To hit the 840g of squash, it took all of one of the largest butternut squashes Meijer had to offer. My wife does most of the cooking, so maybe this is obvious to everyone else, but you can use a potato peeler on the squash! Much faster than trying to cut the rind off. It took me considerably longer than the 5 minutes of prep. I was at Costco shopping and found a container of butternut squash soup already peeled and chopped. I searched for a recipe on my iphone while I was in the store and this recipe popped up. I was loose-goosey with the measurement of the curry powder. It turned out deliciously spicy and pleasantly light. My husband and I loved it and I will make it again. The creamy and delicious soup was an awesome crowd pleaser and appealed to many people. I loved it so much I made it again! It was fairly easy to make it has complex flavors. Wow! What a great easy soup. Like Steve, I added some freshly grated nutmeg, awesome. I made some substitutions based on what was available in my kitchen. I did not have coconut milk so I added an extra teaspoon of coconut oil and some Almond-Coconut milk. I also used water instead of broth. Our first snow storm of the season and what a way to celebrate. Thank you for sharing. Made almost to the letter, as I always say you should the first time, though I subbed Sriracha for the Chile garlic paste, and added a touch of freshly ground nutmeg. Flavor was spot on in all respects. Perfect recipe! This is a fabulous soup. I prepared it exactly to the recipe’s specs, and it turned out beautifully. I’m including it on my Thanksgiving Dinner menu, and I am certain my friends and family love it. I roasted the squash prior to making the soup. I think this makes for a richer, nicer taste and texture. Then again, I used water instead of veggie broth so maybe I missed out on some extra flavor that way. I just made this for dinner. It went together quick and easy, and it was delicious! I added added a can of chickpeas (rinsed and drained) for a little more protein. Love this soup so much! Doubled the recipe so I could freeze half. Used an onion instead of shallots, 1 can of lite coconut milk & one can of full fat. Used yellow curry powder, which is very mild, so didn’t minimize amount. Everything else exactly as written. Immersion stick works perfect, so no need to clean my Vitamix. Thanks so much for an excellent fall soup! Soup was great!! We had to use a vegetable broth substitute bcs I overlooked that ingredient when making my grocery list. Used Thai Red Curry Paste and added real bacon bits and pumpkin seeds. Absolutely fabulous! Hubby had seconds!! Heeeeelp. Everyone says this is a quick recipe? But how in the world do you peel an I roasted butternut squash quickly? It takes me forever and that’s why I stick to certain recipes?. Would LOVE any advice. No need to roast the squash first. Peel first with a carrot peeler (actually very quick! ), then chop into chunks before adding to the pot. Can be done in under 10 min easy. Fall is here! I made this last night and it’s wonderful. I like it so much better than the non vegan butternut squash soups I’ve made. I used a can of regular coconut milk instead of the light. Also, I have a Vitamix, so I didn’t feel the need to return is back to the pot to cook. Delicious! Just made this last night for dinner because I had half of a HUGE butternut squash leftover that needed to be used. I served it with a vegan grilled cheese (made with Chao and a locally-made jalapeno “cheese”) and it was to die for! The soup was so fast to make and it was awesome that I could just use my immersion blender right in the pot. Easy, little cleanup, and warming on a cool night. Will be making again for sure! I just made this soup with full fat coconut milk-and only 1/2 T of maple syrup…so good and so easy-I will make this again most definitively! I used regular onions since I had then on hand… I may add more curry-but not necessary. I used the garlic chili sauce-since I do like it spicey. Very good-thanks for the recipe. This was so warming and delicious! I used 1.5 T yellow curry powder and extra spice and it was great. Thank you for such a perfect fall soup recipe ! Just made this it is AMAZING! Used 1TBS regular curry and 1/2 tsp red curry paste. Delish. Thanks for sharing this. We have made this recipe several times and it is absolutely delicious – definitely one of our new favorites. Thank you! I just finished making this soup, and I must say, that this is my new fall addiction!!! It is warm, satisfying, creamy and spicy ….but seasoned perfectly. What a wonderful way to warm up on a chilly day! I would not change a thing about this recipe. I’m looking forward to dinner!? Made this yesterday and it was amazing. Not too spicy and I even added chili sauce. I used different toppings and added chives, apple and a few cashews. Delicious, thank you so much for the amazing recipe. This is a delicious recipe. I used honey instead of the other two options and it still had a nice sweetness. A wonderful fall treat with beautiful color and rich aromas. I used a bag of frozen butternut squash which only had three cups of squash in it, so I halved the recipe. I made it according to the recipe and liked it, but it seemed just a bit bland. So I added more curry powder and more chili paste and a touch more maple syrup and simmered it some more. It was getting a little too thick so I added some more coconut milk and – why not? – just a bit more chili paste! So, the end result was good, but too spicy. My fault, not the recipe’s creator. I’m not sure if I will make this again just because, even if I held back on going overboard with the spices, I think I’m looking for a recipe that is not a curried soup. But this was very good even with my over-enthusiasm, and my daughter and I ate all of it! I was super pleasantly surprised at how delicious this was! It had just the right amount of spicy and sweet. I will definitely make it again! Damn girl.. This soup is so so good! I started off with just a pinch of the spices but ended up using the exact amounts listed in the ingredients list. I made zero substitutions or modifications. We love spicy foods and this was the perfect amount for soup. We will be adding it to our weekly meals for sure. This recipe is great with a variety of squashes and works perfectly if you are part of a CSA and are looking for something to do with all those vegetables. I made mine with Zucchini, Sweet Dumpling, Delicata, and Red Kabocha squash. It’s fantastic. I went looking for a recipe that I had made for butternut squash around this time last year, wasn’t sure if this was it or not. If it wasn’t, I’m glad I made this one instead. My fiance is a picky eater and he loves it. I did add a little extra curry powder so the kick would be more there. Was thinking about adding some piment sauce to it as well, thoughts? I had some extra summer squash to eat this weekend, and let me say this recipe worked really well with them! I used a medium yellow curry powder for some extra kick. Will definitely be repeating this recipe come fall! This soup is my favorite. Use your recipe many times already. Just made this for dinner and will definitely make it again (I know, I know, it’s spring but I have some squash left over from my parents’ winter garden we gotta eat up!)!!! I added some ginger and a good spoonful of red curry paste for some spicy bite. My husband was skeptical and after tasting it he asked that I make it again! Finally cooked my last squash from the garden using this recipe. Fantastic! I topped it with pumpkin seeds and served with open faced sandwiches. Terrific sunday dinner on a rainy day. Thank you. It was delicious, thank you! It is now one of my favorite recipes, and I make it all the time.